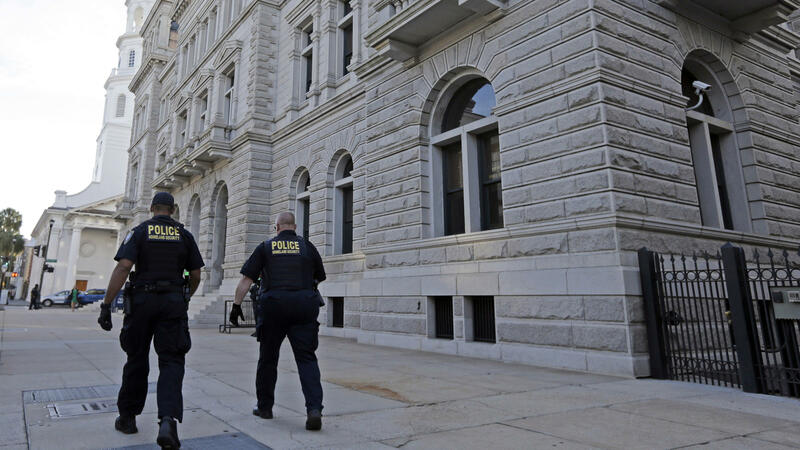 Homeland Security officers walk outside the federal courthouse in Charleston, S.C. Jury selection in the case will resume Monday. "A criminal defendant is not competent to stand trial only if the Court finds 'that the defendant is presently suffering from a mental disease or defect' that renders him 'unable to understand the nature and consequences of the proceedings against him or to assist properly in his defense.' The test for competency is whether the defendant 'has a sufficient present ability to consult with his lawyer with a reasonable degree of rational understanding' and 'has a rational as well as factual understanding of the proceedings against him.' "
He wrote that a defendant must also understand the proceedings and have the capacity to consult with his lawyers. 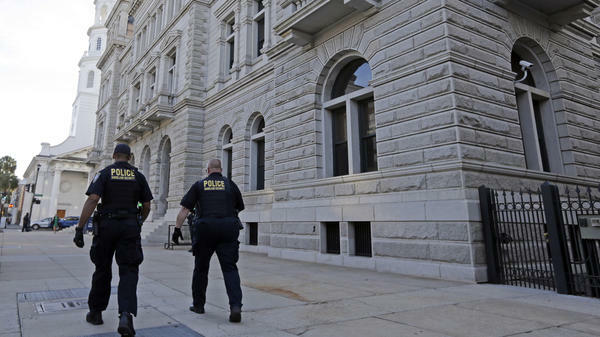 Gergel then concluded that Roof was competent to stand trial. Roof faces the death penalty. He is pleading not guilty. Roof is also facing separate murder charges brought by the state of South Carolina. South Carolina Public Radio's Alexandra Olgin reports that the competency hearing "included testimony from the court-appointed examiner, four other witnesses and additional affidavits," but that the details of the hearing are not being released in order to protect Roof's right to an impartial jury and fair trial. Multiple media organizations including NPR objected to the ruling keeping the hearing closed. Gergel ordered the competency hearing earlier this month after Roof's attorneys "brought up the issue of whether he is mentally able to help his lawyers," The Associated Press reported. "It was the first time Roof's competency has been brought into question. The reason that his lawyers are worried about his mental state has been kept under seal." Jury selection for the trial is scheduled to continue Monday.